The capital city of Cherkassy oblast. Cherkasy (Cherkassy in Russian) is a city and administrative center of the Cherkasy region, Ukraine, an industrial, cultural and educational center. It played a significant role in the origination of the Cossacks. The population of Cherkasy is about 282,000 (2016), the area - 69 sq. km. The phone code - +380 472, the postal code - 18000. Local time in Cherkasy city is April 21, 5:16 pm (+2 UTC). 1 December, 2018 / Catholic Church of St. Anna in Talne. 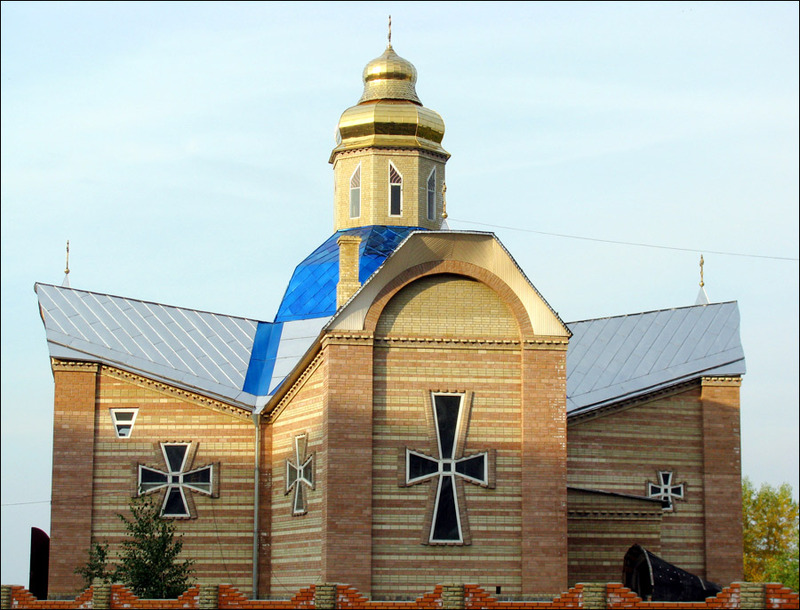 3 April, 2017 / Unusual Orthodox church in the village of Moshny. 20 May, 2016 / Let's take a walk on Khreshchatyk Street in Cherkasy. 3 April, 2013 / Unguessed mystery of Cherkasy city and region. 23 July, 2011 / Beautiful time-lapse video of Cherkassy city. The territory occupied by present day Cherkasy was inhabited more than 6,000 years ago. There are a lot of archaeological sites proving this fact. In the last third of the 13th century, the first settlement which later became Cherkasy was founded on the lands of the Kyiv principality. The first written references were found in the Suprasl Chronicle referring to the events of 1394-1395, as well as in the letters of the Crimean Khan Mengli I Giray. Around 1362, the settlement was included in the Grand Duchy of Lithuania. At the end of the 14th century, Cherkasy was mentioned in the chronicle “List of distant and near Russian towns” as a fortified town. In the period from the 14th to the 17th centuries, the town suffered from attacks by various nomads. During this period, the town became one of the centers of the formation of a new social group - the Cossacks. 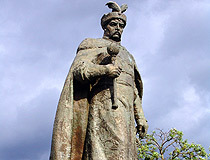 In 1532, Cherkasy sustained a 30-day siege of the Crimean Khan Saadet I Giray. In 1536, the inhabitants of Cherkasy rebelled against the Lithuanian officials, they expelled the elder, officials and garrison from the town and defeated the punitive detachment sent to suppress the insurrection, after which the town was granted the right to appoint a town elder from among the local residents. In 1569, according to the Lublin Union, Cherkasy passed to the Polish Kingdom. 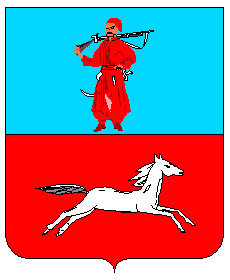 After the beginning of the rebellion of Bohdan Khmelnytsky, in 1648, the Cherkasy Cossacks under the command of F. Jalaliy supported it. According to the Andrusov truce of 1667, Cherkasy remained part of Poland. In 1793, after the partition of Poland, Cherkasy became part of the Russian Empire. In 1815, William Geste developed the first general plan of Cherkasy, according to which the town center received wide long streets intersecting at right angles. After the creation of the shipping company and the construction of the Moscow-Odessa railway line (the bridge across the Dnieper was built near Cherkasy), the town began to develop rapidly. In the second half of the 19th century, new industrial enterprises were opened: sugar refining, sawmill and mechanical plant, the first brewery of Benu and Eremenko, several tobacco factories. Most of the enterprises were located along the Dnieper, for the convenience of transportation of raw materials and products. In the late 19th - early 20th centuries, there was a rapid construction of the town, its buildings and enterprises. 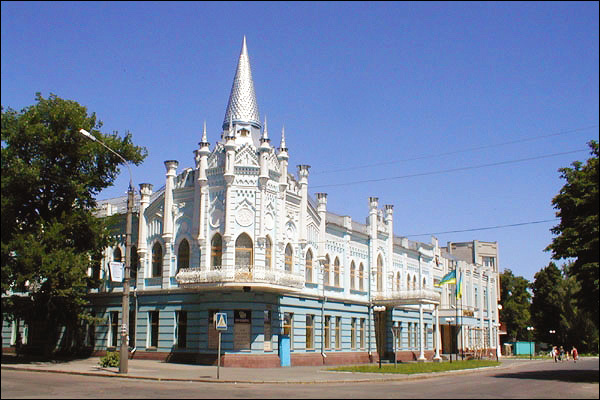 The architecture of Cherkasy combined various forms and styles (modernized classical, Moorish, Gothic). In 1913, the publication of the town newspaper began. In January 1918, Soviet power was established in Cherkasy, then it was occupied by the advancing Austro-German troops. During the Civil War, Cherkasy passed more than 10 times from hand to hand, was subjected to shelling and destruction, several thousand inhabitants were victims of fighting and terror. In 1920, it became part of the Ukrainian SSR. In 1927, municipal transport began to operate in Cherkasy. In 1930-1934, on the basis of the pedagogical technical school, the Cherkasy Pedagogical Institute was created. Since 1932, the city was a district center of the Kyiv region. August 22, 1941, Cherkasy was occupied by the German troops. December 14, 1943, the city was liberated by the Red Army. The restoration began after the end of the battles and continued during the fourth five-year plan (1946-1950). 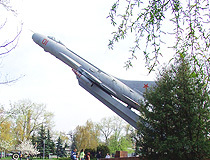 In 1954, the city became the capital of the Cherkasy region. In 1958-1961, a chemical fiber plant was built. In 1962, the construction of a chemical combine began. In 1965-1967, a silk factory was built. 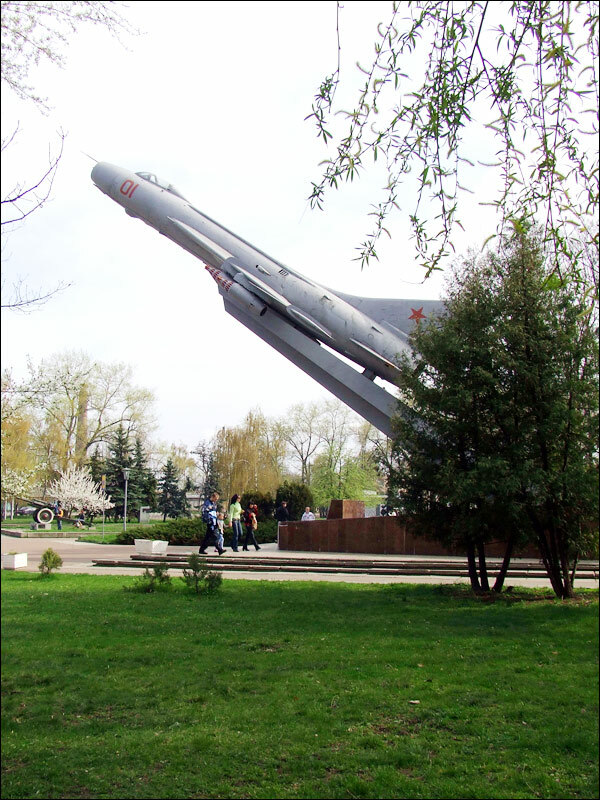 In 1967, a city park was created named after the 50th anniversary of the October Revolution. In 1970, the Cherkasy Puppet Theater was founded. In 1986, the movie theater “Cherkasy” was built. Since 1991, Cherkasy is a regional center of Ukraine. After Ukraine gained independence, the local industry was partially in decline. Cherkasy lost the status of the “chemical giant”, which it became in the Soviet era. Today, it is one of centers of Ukrainian automotive industry. 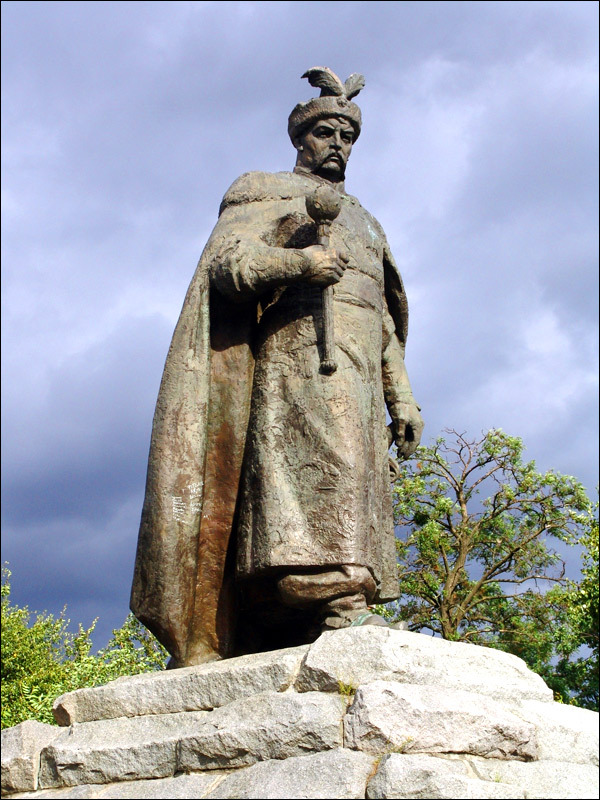 In 1995, the statue of Bohdan Khmelnitsky was erected on the main street of the city - to commemorate the 400th anniversary of the hetman who was born in this region. For the years of Ukraine’s independence, the architectural appearance of Cherkasy has undergone changes - however, not all of the new buildings harmoniously blended with the urban landscape created throughout the 20th century. Cherkasy stands on the right bank of the Kremenchug reservoir built in the middle reaches of the Dnieper River, about 192 km southeast of Kiev along the highway. Cherkasy has a railway station, a river port and an airport. July is the warmest month of the year. The average temperature in July is plus 20.7 degrees Celsius. January is the coldest month with the average temperature of minus 5.2 degrees Celsius. This city is an important economic center of Ukraine, various industries are represented here. The most developed local industries are the chemical industry, motor industry and food industry. Passenger transportation on the territory of the city is carried out by buses, trolleybuses and taxi cabs. In Cherkasy there is an airport however it provides only a small number of charter flights across the territory of Ukraine. Cherkasy river station was reconstructed and opened in August 2011. Originally, Cherkasy was located in the lowland along the Dnieper River. At the expense of the Lithuanian merchants a post was organized, where visiting merchants paid “myto” for the right to trade with local merchants. Today, this district of Cherkasy is called Mytnitsa. The City Day of Cherkasy is celebrated on the third Saturday of September. Throughout its history, Cherkasy was destroyed and rebuilt several times. Only few buildings of the 19th century survived. The system of streets and squares of the old part of the city is one of the few remaining monuments of town-building art of the 19th century in Ukraine. 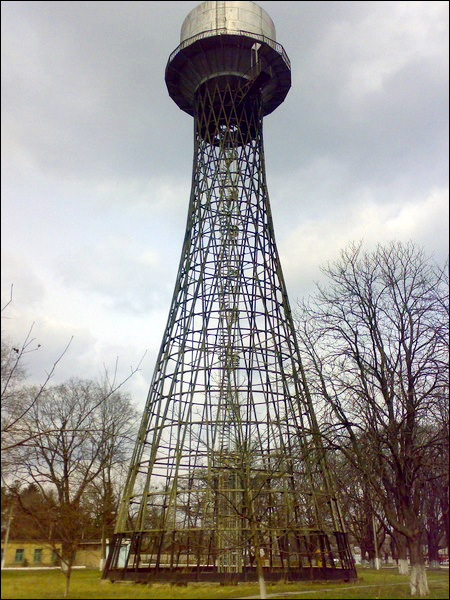 There is a unique architectural monument in Cherkasy - one of the first hyperbolic constructions in the world - a beautiful open-work water-tower made of steel. 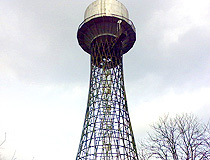 This hyperbolic water-tower was designed by the great engineer and scientist Vladimir Grigoryevich Shukhov. The tower is located on the territory of “Vodokanal”, a water utility company. Hetmana Sahaidachnoho Street, 12. Scherbina House (The Wedding Palace). It was the most luxurious mansion in the pre-revolutionary Cherkasy. In Soviet times, it was known as “The Palace of Happiness” because it was the city’s registry office. The house was built by the entrepreneur A. Scherbina in 1892. 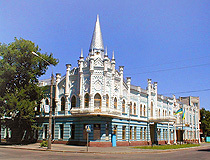 Since 1970 and up to now the building is used as the Wedding Palace of Cherkasy. Nebesnoi Sotni Street, 3. The building of the former hotel “Slavyanskaya”. It was constructed in the late 19th century by means of the entrepreneur Skoryna in Art Nouveau style with elements of pseudo-Gothic. In Soviet times, it was the hotel “Dnieper”. Today, the building belongs to “Ukrsotsbank”. Ostafiya Dashkovycha Street, 20. Tsybulsky House (Museum of Kobzar). This historic building located in the center of the city was built in the middle of the 19th century. In Soviet times, the museum of one book - “Kobzar” by Taras Shevchenko - was opened here. Khreshchatyk Street, 217. Opening hours: 9:00-17:00. Days off: Monday, Friday. Cherkasy Regional Museum of Local Lore. The museum is located in the historical center of the city in a building constructed in 1985, near the Hill of Glory (Castle Hill). In 30 halls there are sections about the nature of the region, archeology, ethnography, the history of the region in the 14th - early 20th centuries, as well as modern history since 1917 up to the present. In total, there are about 12 thousand exhibits. Slavy Street, 1. Opening hours: 10:00-17:00. Days off: Monday, Friday. Cherkasy Art Museum. The department of decorative and applied art introduces the folk art of the middle Dnieper people. In the second section there are icons of the 17th-19th centuries, portraits of the 18th-20th centuries. Khreshchatyk Street, 259. Opening hours: 10:00-17:00. Day off: Monday. Cherkasy City Archaeological Museum of the Middle Dnieper. The collection includes several thousands of finds from all epochs and cultures from the area of the Middle Dnieper, from the Paleolithic period to the Cossack times, as well as objects of the 18th-20th centuries. Also there items of traditional Ukrainian culture. Smilyanska Street, 21. Monument “Motherland” on the Castle Hill (the Hill of Glory) - a memorial complex on Slavy Street. From the top of the hill you can see a panorama of the Kremenchug reservoir. 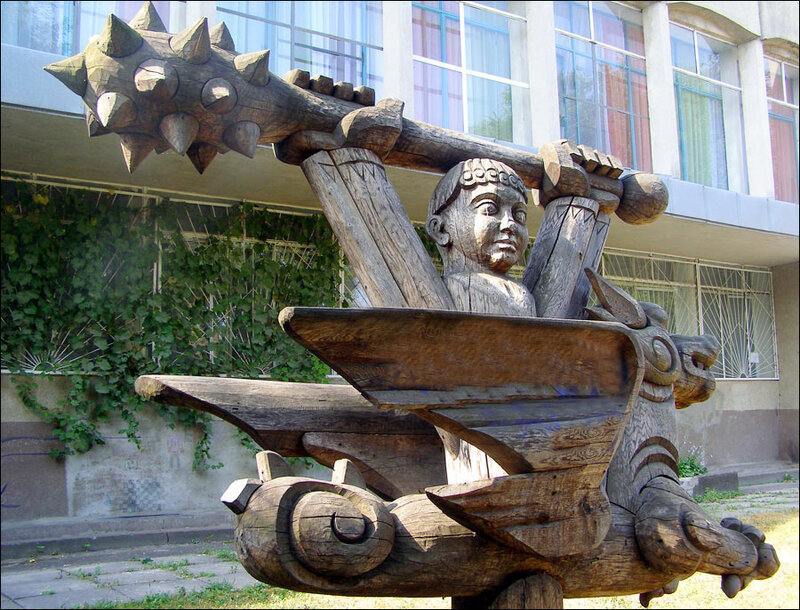 Monument to the Dumpling (Varenik) - the first monument in Ukraine honoring one of the classic dishes of Ukrainian cuisine - “vareniki” (dumplings). The monument was erected near the hotel “Rosava” in 2006. 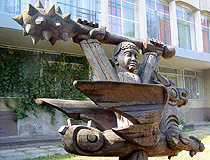 The sculpture is a Cossack Mamai eating vareniki. Behind his back you can see a huge dumpling in the shape of a crescent moon. The height of the monument, made of ceramics, is 2.5 meters. Verhnya Horova Street, 29. 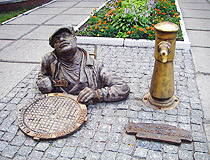 Monument to the Plumber. 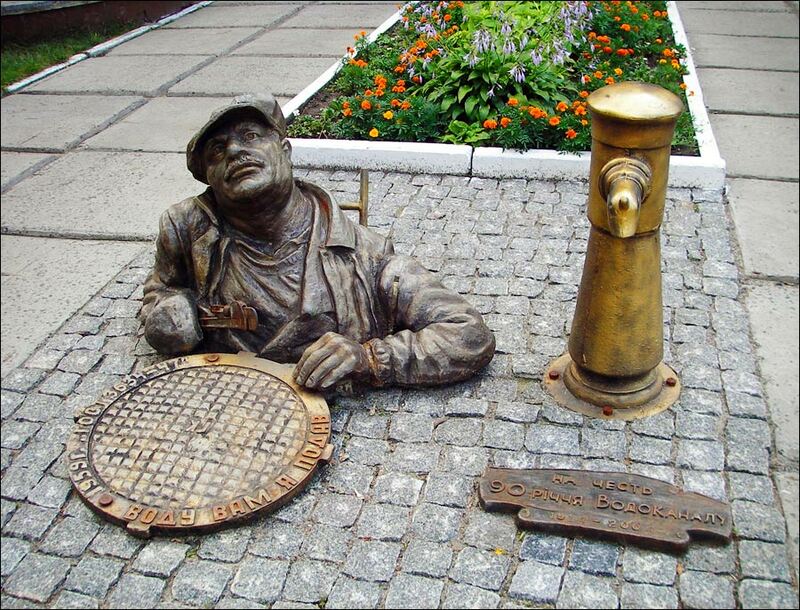 The monument was erected at the entrance to the water utility company “Vodokanal” in honor of its 90th anniversary. The text on the hatch cover means “I gave you the water”. Near it, you can see a fire hydrant of the Russian Empire times. Hetmana Sahaidachnoho Street, 12. Cherkasy Zoo. The zoo is located in the south-western part of the city. A large number of diverse plants grow on a territory of 4 hectares. There are over 200 species of animals. The total number of animals living here is about 500 (including birds and reptiles). Smilyanska Street, 132. Opening hours: 9:00-19:00 (in winter: 10:00-17:00). Pine Forest Park. This park is a monument of landscape architecture founded in 1967. It is located on the bank of the Dnieper River on the territory of 49 hectares. There is a system of ponds, from which water cascades and waterfalls down to the Dnieper. The central element of the composition is a pond with a statue of a mermaid. In the park, there are over 70 species of exotic trees. You can see scenic views of the Dnieper from the “Bridge of Love” constructed over a ravine. Palokhy Street, 2. Cherkassy Regional Academic Puppet Theater is located in the central part of the city, in a building, which is an architectural monument of the 19th century. The front side of the building is decorated with a mosaic with the heroes of children’s fairy tales. Nebesnoi Sotni Street, 4. Music College. The building of the Music College named after S. Gulak-Artemovsky was constructed as a male gymnasium in 1903. The author of the project was the outstanding Kyiv architect of Polish origin Wladyslaw Horodecki. 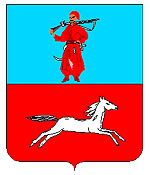 Zamkovyi Descent, 6. Cherkasy Regional Philharmonic Society. The building was constructed in the central part of the city in 1955, on the site of a pre-revolutionary hotel. By the quality of acoustics, this philharmonic hall is in the third place in Ukraine. In 1957, the famous Ukrainian Cherkasy Chorus was organized here. Khreshchatyk Street, 196. Light and Music Fountain. The fountain located in the park near the regional administration was opened after ten years of inactivity in 2008. The fountain works from May to October. Shevchenka Boulevard, 185. Face Wall (The Wall of Cherkasy People). It is a 35-meter wall decorated with photographs of more than 4,000 residents of the city, as well as portraits of famous people of the region: T. Shevchenko, B. Khmelnitsky, V. Symonenko, former mayors of Cherkasy, champions of Ukraine, Europe in various sports. The wall is located in Rose Valley Park - a small park on the bank of the Dnieper, about 500 meters from the city center (Haharina Street, 11). If you move away from the wall a few meters, then the portraits form the phrase “Mi - Cherkasy!” (“We - Cherkasy!”). In winter, the authors of the project move it to one of the city’s museums to protect it from snow and frost. 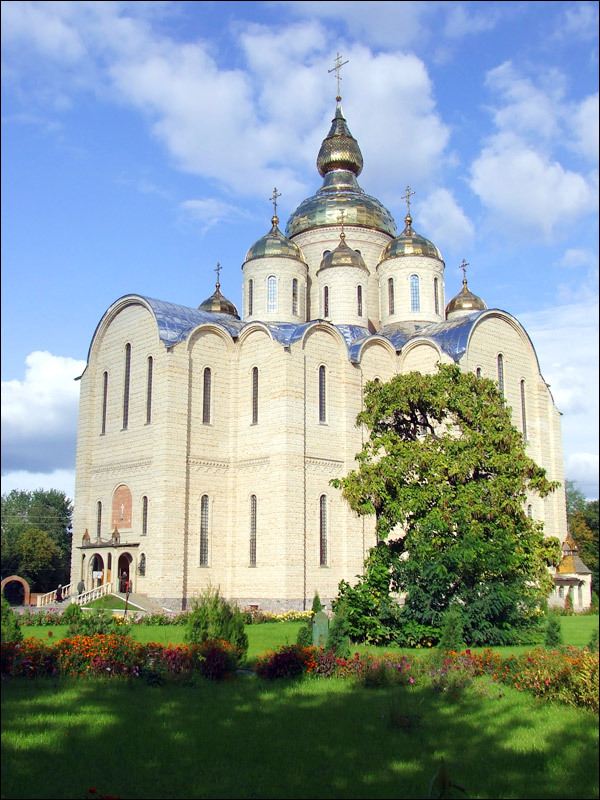 St. Michael’s Cathedral - the largest church in Ukraine (72 meters in height). Built in the Byzantine style, it can simultaneously accommodate up to 12 thousand people. Nadpilna Street, 212. Trinity Cathedral. 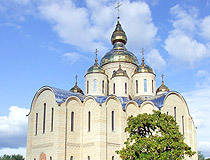 The Holy Trinity Cathedral was rebuilt in Cherkassy in 1991, next to the Castle Hill, where used to be the main Orthodox church of the city. In 1961, the original church was demolished because of the construction of the memorial complex “the Hill of Glory”. Slavy Square, 10. White Lotus Temple. 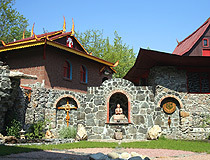 The largest in Europe Buddhist temple “White Lotus” was founded in Cherkasy in 1988 and built in the 1990s. Followers of Buddhism study Thai boxing and kung fu here. On Sundays (at 12:00 a.m) there are guided tours, tea ceremonies. It is also possible to organize a wedding ceremony. Franka Descent, 4. Church of All Saints of the Cherkassy Land and the Nativity of John the Baptist in the village of Khutory located in the south-western suburb of Cherkasy. The height of the church is 54 meters. The church resembles an ancient castle, as well as the Moscow Kremlin. You can climb the spiral staircase of the bell tower and enjoy the views of Cherkasy and the surrounding area. The following English friendly hotels located in Cherkasy have the highest ratings according to visitors’ reviews. Hotel “Optima Cherkasy” of the network Reikartz Hospitality Group is located in the very center of Cherkasy at the intersection of Shevchenka Boulevard and Lazarjeva Street, opposite Soborna Square and the Cherkasy Regional Administration. The restaurant “Provence” offers French and Italian cuisine. 79 rooms of different categories, free Wi-Fi, air conditioning, bar, laundry. Lazarjeva Street, 6. Phone: +380 472 59 01 14. Hotel “Apelsin” (“Orange”) - a modern hotel and restaurant complex located in the middle of a mini park in an ecologically clean area about 1 km from the center of Cherkasy. 54 single and double rooms, air conditioning, free Wi-Fi and parking, transfer, restaurant, bar, beach, pets are not allowed. Verhnya Horova Street, 145. Phone: +380 472 37 74 61. Hotel “Ukraine”. This hotel complex is located near the center of Cherkasy in a pine forest near the Dnieper River. Two restaurants (European cuisine), bar, free Wi-Fi and gym, air conditioning, bowling, sauna, billiards, transfer, parking, pets are allowed. Lisova Street, 1. Phone: +380 472 32 10 52. Hotel “Dnipro”. This hotel located in the center of the city has 73 rooms. Well-groomed territory on the slopes of the Dnieper with lawns, flower beds and an orchard. Free Wi-Fi, air conditioning, restaurant, sauna, beauty salon, transfer, parking, pets are not allowed. Verhnya Horova Street, 13. Phone: +380 472 36 01 99. Very nice, I will visit this summer and would like to visit the parks and gardens near the Dnieper River and of course the giant dumpling!